A pre-curved, form fitting extrication glove designed by auto extrication specialists. Anatomically designed glove body is made entirely of "air-textured", high-tenacity genuine DuPont Cordura. This exceptionally durable, lightweight material is reinforced at all the high wear areas. Additionally, this glove has vented, form fitting protective rubber guards welded to the backs of all fingers, reflective trim, a brow wipe and elastic "snuggler" at wrist to repel debris. 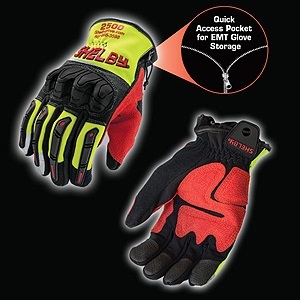 This Shelby glove is armor for the hands that offers unmatched protection and fit in the field of extreme for safety at work. Imported.